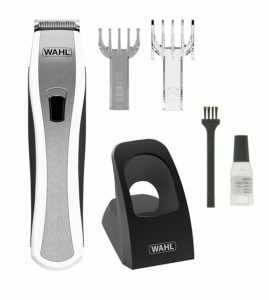 Ever since it invented the first ever practical hair clipper for men during 1919, Wahl has been in the news for its high-quality blades that come powered with advanced technology and trimmers with user-friendly features. The Lithium Pro Stubble Trimmer is one of the most advanced models in the market today, and they have double the power than most of the other reputed trimmers. Look through our review of this stubble trimmer for its awesome features, pros, and cons and you will understand why it is sensible to invest in this. There are two sides to a coin. Similarly, the Wahl Lithium Pro Stubble Trimmer too comes with its shortcomings and benefits. Nevertheless, it is one of the best models available in the market today, if you are looking for a trimmer that comes with an attractive price and sophisticated technology then this trimmer comes with rechargeable batteries that are 100% more powerful than most of the other leading brands, thereby giving you full value for your money. Has 3.6 out of 5 stars with 65% four star and higher, and over 25% two stars or lower. The reviews on this stubble trimmer are all over the board, and we suggest you look through some more of our reviews to see if this is the right one for you.